Give this pipe a chance to handle a generated error. Set the url for the request. Add a header to the http post. Check remote server certificate signed by a known root CA. Request a particular response encoding if available. Return at most size bytes of body. Set a completion callback for this URLRequest. Initialize the object. Called during construction. Handle action specific url request configuration. Declaration of unimplemented method to prevent copy construction. Class to handle url based requests. Currently, this class is implemented on top of curl. From the vantage of a programmer using this class, you do not care so much, but it's useful to know since in order to accomplish 'non-blocking' behavior, we have to use a more expensive curl interface which can still block if the server enters a half-accepted state. It would be worth the time and effort to eventually port this to a raw client socket. Definition at line 63 of file llurlrequest.h. This enumeration is for specifying the type of request. Definition at line 69 of file llurlrequest.h. Definition at line 205 of file llurlrequest.h. action One of the ERequestAction enumerations. Definition at line 132 of file llurlrequest.cpp. url The url of the request. It should already be encoded. Definition at line 139 of file llurlrequest.cpp. References initialize(), LLMemType::MTYPE_IO_URL_REQUEST, and setURL(). Definition at line 149 of file llurlrequest.cpp. The header must be correctly formatted for HTTP requests. This provides a raw interface if you know what kind of request you will be making during construction of this instance. All required headers will be automatically constructed, so this is usually useful for encoding parameters. Definition at line 173 of file llurlrequest.cpp. References mDetail, LLURLRequestDetail::mHeaders, and LLMemType::MTYPE_IO_URL_REQUEST. Referenced by LLXMLSDRPCClientFactory< Client >::build(), LLSDRPCClientFactory< Client >::build(), configure(), and request(). Set whether request will check that remote server certificates are signed by a known root CA when using HTTPS. Use the supplied root certificate bundle if supplied, else use the standard bundle as found by libcurl and openssl. Definition at line 191 of file llurlrequest.cpp. References FALSE, LLURLRequestDetail::mCurl, mDetail, and TRUE. Returns true if this is configured. Definition at line 422 of file llurlrequest.cpp. References addHeader(), LLBufferArray::countAfter(), HTTP_DELETE, HTTP_GET, HTTP_POST, HTTP_PUT, LLChannelDescriptors::in(), llendl, llwarns, mAction, LLURLRequestDetail::mChannels, LLURLRequestDetail::mCurl, LLURLRequestDetail::mCurlMulti, mDetail, LLURLRequestDetail::mHeaders, LLURLRequestDetail::mNeedToRemoveEasyHandle, LLURLRequestDetail::mResponseBuffer, LLMemType::MTYPE_IO_URL_REQUEST, LLURLRequestDetail::mURL, NULL, and S32. Definition at line 490 of file llurlrequest.cpp. References LLBufferArray::append(), LLURLRequestDetail::mBodyLimit, LLURLRequestDetail::mChannels, mDetail, LLURLRequestDetail::mIsBodyLimitSet, LLURLRequestDetail::mResponseBuffer, mState, LLMemType::MTYPE_IO_URL_REQUEST, LLChannelDescriptors::out(), STATE_PROCESSING_RESPONSE, and STATE_WAITING_FOR_RESPONSE. Definition at line 395 of file llurlrequest.cpp. References downCallback(), LLURLRequestDetail::mCurl, LLURLRequestDetail::mCurlErrorBuf, LLURLRequestDetail::mCurlMulti, mDetail, mState, LLMemType::MTYPE_IO_URL_REQUEST, sCAFile(), sCAPath(), STATE_INITIALIZED, and upCallback(). Definition at line 271 of file llurlrequest.cpp. References configure(), count, LLFastTimer::FTM_CURL, HTTP_POST, HTTP_PUT, llendl, llwarns, mAction, LLBufferArray::makeChannelConsumer(), LLPumpIO::LLLinkInfo::mChannels, LLURLRequestDetail::mChannels, mCompletionCallback, LLURLRequestDetail::mCurl, LLURLRequestDetail::mCurlMulti, mDetail, LLURLRequestDetail::mNeedToRemoveEasyHandle, LLPumpIO::LLLinkInfo::mPipe, LLURLRequestDetail::mResponseBuffer, mState, LLMemType::MTYPE_IO_URL_REQUEST, LLURLRequestDetail::mURL, NULL, PUMP_DEBUG, LLPumpIO::respond(), LLURLRequestComplete::responseStatus(), S32, STATE_HAVE_RESPONSE, STATE_INITIALIZED, STATE_PROCESSING_RESPONSE, STATE_WAITING_FOR_RESPONSE, LLIOPipe::STATUS_BREAK, LLIOPipe::STATUS_DONE, LLIOPipe::STATUS_ERROR, LLIOPipe::STATUS_NO_CONNECTION, LLIOPipe::STATUS_OK, and LLIOPipe::STATUS_STOP. This call is a shortcut for requesting a particular encoding from the server, eg, 'gzip'. Definition at line 179 of file llurlrequest.cpp. References LLURLRequestDetail::mCurl, mDetail, and LLMemType::MTYPE_IO_URL_REQUEST. Definition at line 185 of file llurlrequest.cpp. References LLURLRequestDetail::mBodyLimit, mDetail, and LLURLRequestDetail::mIsBodyLimitSet. The callback is added to this URLRequet's pump when either the entire buffer is known or an error like timeout or connection refused has happened. In the case of a complete transfer, this object builds a response chain such that the callback and the next process consumer get to read the output. This setup is a little fragile since the url request consumer might not just read the data - it may do a channel change, which invalidates the input to the callback, but it works well in practice. Definition at line 200 of file llurlrequest.cpp. References headerCallback(), mCompletionCallback, LLURLRequestDetail::mCurl, mDetail, and LLMemType::MTYPE_IO_URL_REQUEST. @ brief Set certificate authority file used to verify HTTPS certs. Definition at line 603 of file llurlrequest.cpp. @ brief Set certificate authority path used to verify HTTPS certs. Definition at line 609 of file llurlrequest.cpp. This method assumes the url is encoded appropriately for the request. The url must be set somehow before the first call to process(), or the url will not be set correctly. Definition at line 155 of file llurlrequest.cpp. References mDetail, LLMemType::MTYPE_IO_URL_REQUEST, LLURLRequestDetail::mURL, and NULL. Referenced by LLXMLSDRPCClientFactory< Client >::build(), LLSDRPCClientFactory< Client >::build(), LLURLRequest(), and LLContextURLExtractor::process_impl(). Definition at line 524 of file llurlrequest.cpp. 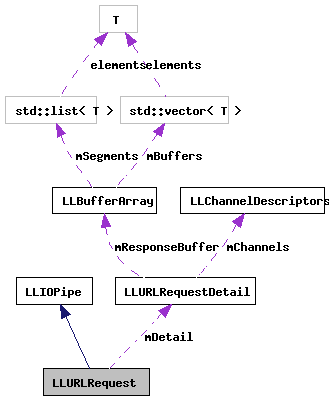 References LLBufferArray::countAfter(), LLChannelDescriptors::in(), llmin(), LLURLRequestDetail::mChannels, mDetail, LLURLRequestDetail::mLastRead, LLURLRequestDetail::mResponseBuffer, LLMemType::MTYPE_IO_URL_REQUEST, LLBufferArray::readAfter(), and S32. @ brief Turn off (or on) the CURLOPT_PROXY header. Definition at line 216 of file llurlrequest.cpp. References FALSE, lldebugs, llendl, LLURLRequestDetail::mCurl, mDetail, and NULL. Definition at line 213 of file llurlrequest.h. Referenced by configure(), and process_impl(). Definition at line 215 of file llurlrequest.h. Referenced by process_impl(), and setCallback(). Definition at line 214 of file llurlrequest.h. Referenced by addHeader(), checkRootCertificate(), configure(), downCallback(), initialize(), process_impl(), requestEncoding(), setBodyLimit(), setCallback(), setURL(), upCallback(), useProxy(), and ~LLURLRequest(). Definition at line 212 of file llurlrequest.h. Referenced by downCallback(), initialize(), and process_impl().